On Monday 15 October, I gave a short after dinner speech at Chatham House, to forty or so invited guests from the upper echelons of industry and policy making. Or rather I did the pudding. 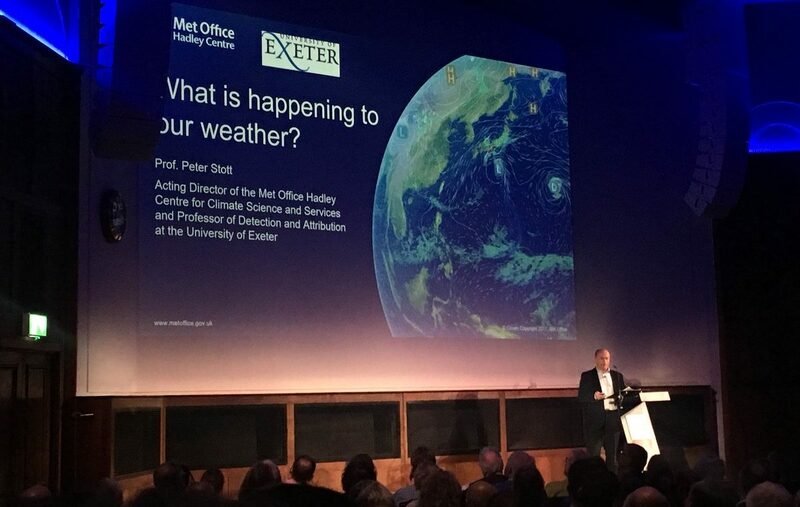 My fellow attributors of extreme weather events, Myles Allen and Fredi Otto from Oxford University, had done the starter and the main course respectively. They set out the case for how and why our weather is changing while their plate of food sat uneaten before them and everybody else tucked in. I was asked to talk about science communication over a sorbet. There was a delicious irony in my having the dessert course of this dinner that was taking place during the annual Chatham House meeting on climate change. I’m not referring to the food, which thankfully didn’t melt while I made my point about the irony. It was me being asked to go last that I thought was telling. We’d done the meaty stuff – although, remarkably perhaps, all Chatham House food is now vegetarian – so now it was time for something sweet and fluffy to round things off. I’m not criticising the organisers for the ordering of the speeches. Far from it. It gave me an opportunity to use the metaphor of the three courses to try to make my point. I think high quality communication of climate science needs to happen at the beginning, middle and end of our collective attempts to avoid catastrophic climate change. We can’t wait until climate scientists have beaten down their scientific uncertainties to almost nothing before acting on the information we have, including about the big risks we face from melting ice sheets and dangerous storms. And we can’t wait until we have all the solutions to reducing our greenhouse gas emissions. Climate change poses a great threat but collective human will and endeavour provides a great hope. We don’t fully understand the extents of either. But we need to talk more about both, now, before it is too late. This means we need climate scientists to get better at communicating our science. This is why I have been exploring how the arts can enhance scientists’ ability to talk about climate change through the Climate Stories project I lead. Our NERC funded project has shown us there are many talented people ready to take up the outreach challenge in innovative and more effective ways. But we climate scientists can’t save the world by ourselves. There have to be people in positions of power ready to listen to what we have to say, help us get our scientific message out, and move our societies faster in the direction our science tells us we have to go. For over twenty years, we scientists have been telling the world that climate change is real, that global warming is human-caused and that it’s bad for our survival as a species. Over that time there has been no shortage of influential people working to obstruct that message being heard. But now we seemed to have reached a new stage in climate science denial. It’s one of apathy rather than outright hostility. It seems like publishers and broadcasters have an aversion to doing climate change because it’s too depressing and doesn’t sell. That attitude doesn’t make sense. I learnt during the Chatham House event about some of the progress that is being made to solve the climate problem. I heard about a former oil company that has switched its entire business to making off shore wind turbines, some off which rise more than 250 m tall. I found out that car manufacturers are rapidly scaling up their production of electric vehicles. And I discovered that regulation, backed up by legislation, is rapidly forcing industry to change their business models so they avoid stranded assets and expensive litigation. Understanding the nature of climate change and realising there are solutions can make people empowered to do something to stop it. And climate science isn’t just useful, helping us chart our progress to a safer world. It’s also fascinating. The tale of how we detected the fingerprints of human activity on changes in our atmosphere and oceans is just as interesting as the story of how we discovered the fundamental particles of nature or how we uncovered the hidden workings of the brain. We may still be chewing through the starter course of solving the climate change conundrum. But it’s now that we need to start hearing more from climate scientists. We’re going to need to if we want to make it safely to the promised sweet dessert.